HP’s done a pretty good job of remaining relevant in the fast-changing mobile space, at least as it relates to laptops and 2-in-1’s. Delivering sleek looks and high value, detachables and convertibles like the HP Elite X2 have joined the loudening chorus of Windows 10 devices which have made Android tablets and even iPad’s less relevant, albeit to varying degrees. This year, HP’s building on this success by emboldening security, streamlining further, and as always, packing value in the new, LTE-capable HP Elite X2 1013 G3. 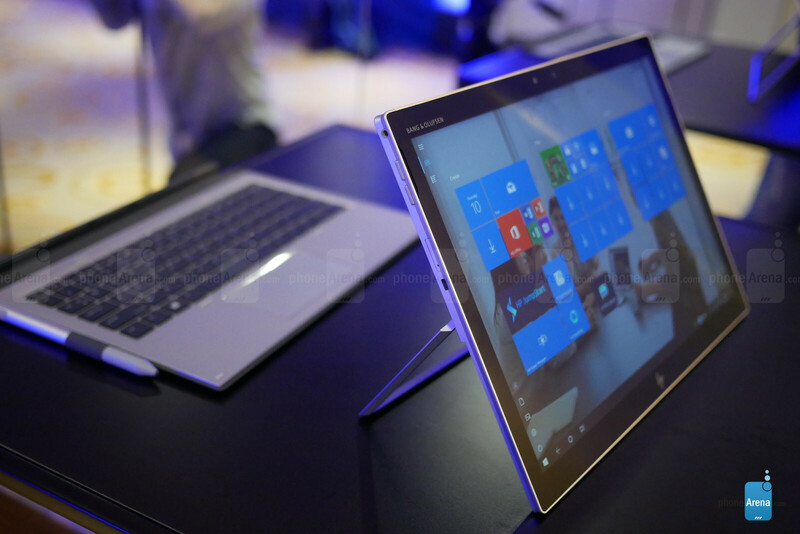 Starting at $1499 this detachable is slated for a June release, but we were lucky enough to grab some hands-on time to show you what HP’s accomplished. The HP Elite X2 1013 G3 utilizes a style popularized and refined by Microsoft and its Surface lineup. 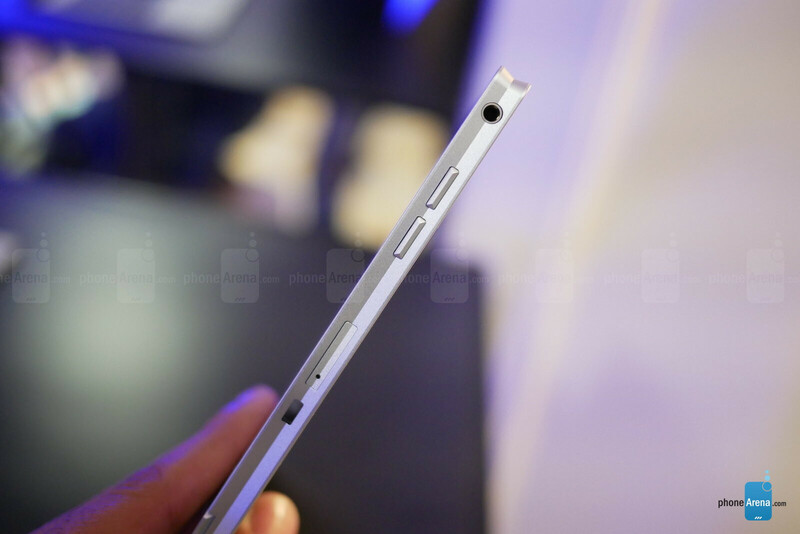 This kickstand-toting, aluminum tablet body and magnetically attached, free-hanging keyboard design not only keeps the HP Elite X2 thin and light, but also versatile. The kickstand extends far enough back to use the device as a sort of easel or standing tablet, while the keyboards flexibility allows you to fold the keyboard behind the tablet and use the device as a notebook complete with a pen and all. The pen is optional, though, but has itself been improved to include tilt detection, double the pressure sensitivity, and a proximity sensor so you never walk away and lose it. The pen is also rechargeable via USB-C, enabling it to gain a week’s worth of use from just a 30-minute charge. 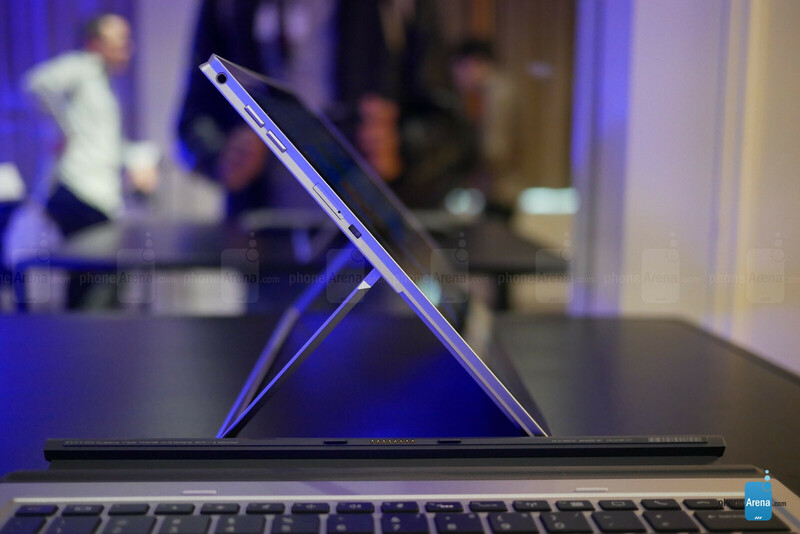 In terms of overall feel, the aluminum body of the tablet portion feels quite light and sturdy, while the keyboard gives us much the same feeling. Unlike most folio-like, magnetic keyboards the HP Elite X2’s keyboard has a metal top and fabric on the back, giving the user a premium laptop feel while typing, and a softer feel when carrying the device. 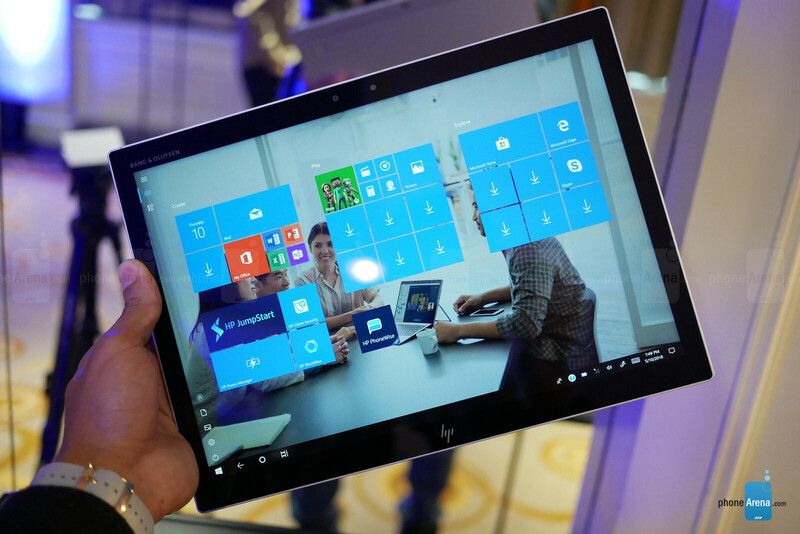 By minimizing bezels, HP was able to fit a 13-inch IPS-LED display into the same footprint as last year’s 12-inch model. 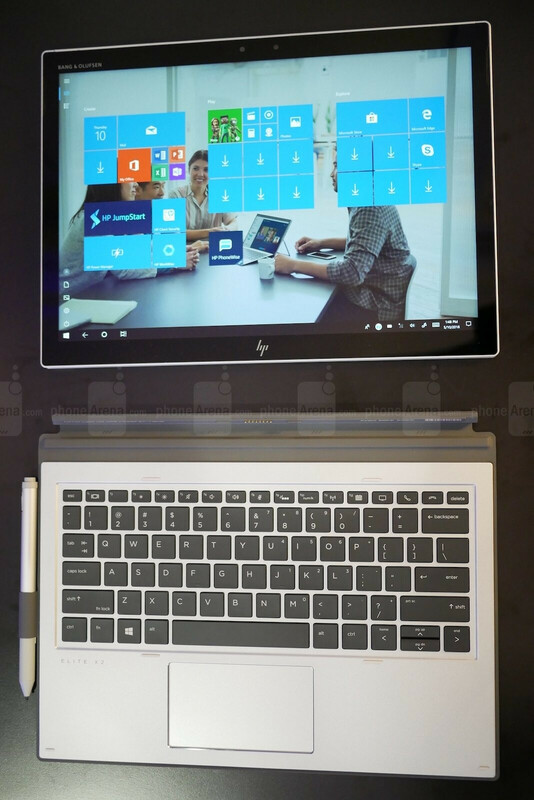 Gorilla Glass 4 covers this 3000 x 2000px display, but our favorite addition is HP Sure View. This is HP’s display technology which enables your screen to become unreadable to those at the sides of you, all with the quick tap of a keyboard button. Unfortunately, this isn’t a standard feature though, and it’s unclear how much this option will cost. The HP Elite X2 1013 G3 can run on either Windows 10 Home or Pro. Of course, you may find some bloatware depending on your configuration and where you purchase it, but thankfully we didn’t see much of any during our time with the device. The Elite X2 will be offered with anywhere between 128GB and 1TB of storage, up to 16GB RAM, and i3, i5, and i7 Intel Core (quad-core) processors clocked as high as 1.9GHz base and 4.2GHz with Turbo Boost. If you wanna catch the attention of mobile geeks like us when you’re talking laptops and detachables, just mention the phrase “4G LTE.” That’s exactly what the HP Elite X2 1013 G3 is capable of. As expected, this is an optional feature and pricing/carrier availability isn’t yet clear but opting for this will get you a CAT9 LTE chip onboard, something we can’t help but lust after just a little bit. Thankfully, this detachable also meets some respectable battery life metrics, rated for up to 10 and a half hours. Of course, LTE, Wi-Fi, and the general hardware configuration will have significant effects on this. HP’s Elite X2 1013 G3 is a solidly built, good-looking device. Aimed at those who want little sacrifice or separation between their work hardware and their play hardware, the newest X2 makes small but meaningful improvements over its predecessor with better-equipped accessories like the rechargeable pen, as well as the addition of HP’s Sure View technology and 4G LTE capability. Devices like these continue to make a strong case for Windows-based 2-in-1’s over iOS or Android-powered tablets, but will a starting price of $1499 keep the Elite X2 from being considered more seriously by the average consumer? That price point is worrisome if the LTE capability is it's main selling point. The few seconds it involves connecting to a phone's hotspot is not worth the premium. I've had many LTE-enabled laptops and 2-in-1s before and it takes almost as long to acquire an LTE signal from sleep as it would to hotspot it.